Lately, I have been sharing a lot of the lighter stuff here as I have given myself the gift of an escape into the world of pink buttons and flowered fabric and creating. It has been an escape from this. And, I must admit that it is a true gift to myself. I see it as a gift because I simply cannot do the heavy lifting all the time. As I watch the trees begin to bloom, the buds of new leaves appear, and the continued growth of the tulips, I begin to see how I spend a lot of time pushing and growing and extending. And that when I allow myself some time to bask in the growth, I begin to bloom. I know the metaphor might be too much here, but this is truly how it feels. This time away from working on myself and trying to learn the lessons feels a bit like the gift of a tulip blossom. Last year at ArtFest, I purchased a pendant that said “spring shall return.” When I first spotted it, I stood there and just started to cry. As I said to Jon and later to Kelly, the artist made this for me, though she didn’t know it at the time. The shell, the bit of turquoise, the words…my grandmother died in the spring of 2005. She died during her favorite time of year. Right when everything was in bloom. I hadn’t been to South Carolina in the spring for several years and I remember thinking as we drove to the funeral home that I could not believe that she died when all her flowers were blooming – didn’t she want to see them? It would have made sense if she had died in the middle of the hottest day or the coldest day of the year…but spring? The poem I wrote last week (and posted for Poetry Thursday), spoke to a realization about all of this…about a new understanding of her connection to it all. And, as I wish for her to be here for me to talk to about a few things going on in my life, especially in those moments when I just want to tell someone something and she would be the first person I would have called, I am sitting with the thought that I can simply continue to breathe and bloom all by myself because I already have the tools I need to grow. In a way, it feels a bit like I am giving myself the gift of spring. 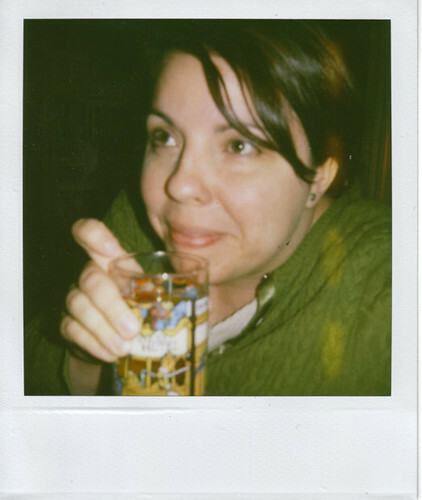 Here is one of my most recent daily polaroids. I think it captures how I have been feeling lately.